The undisputed King of the Autobot Headmasters has returned! 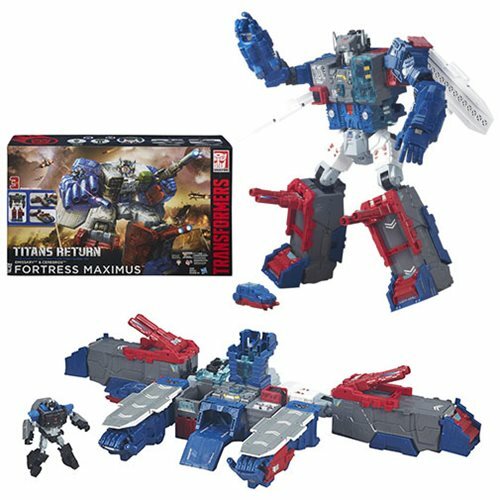 Hasbro's Transformers Generations Titans Return Fortress Maximus is the biggest Transformers hero of the year! Armed with loads of guns, the best Autobot stronghold since Metroplex can change from a city to a space ship to a giant robot. The giant robot's head hides even more secrets - electronics play the classic "Transformation" sound when connected, and the head itself can become a robot, Cerebros. Even more amazing, Cerebros' head comes off and forms the smaller robot Emissary! Measures approximately 23 1/2-inches tall. With light and sound effects, this is the can't-miss giant Autobot of the season. It can even connect with other Titans Return leader-class toys (sold separately) in base mode to form big cities for your Titan Masters to battle over, hide in, and be imprisoned in - Fort Max even includes a little cell! Trust us when we say you do not want to miss this one. Requires 2x "AAA" batteries, not included. Ages 8 and up.